According to an article in the MetroWest Daily News, a Framingham woman was arrested for assaulting her husband last week. The article reports that the wife came home drunk and screamed at her husband. She then reportedly left the room, got a kitchen knife and returned, waving the knife close to her husband and continuing to scream. The husband told police that the wife then went into a room with the couple’s children and locked the door. It was at this point that the husband reportedly called the police. When officers arrived, they could not locate any knife, but arrested the wife anyway and charged her with assault with a dangerous weapon. For the Commonwealth to prove that the wife committed an assault with a dangerous weapon under G. L. c. 265, § 15B(b), it would have to show the following beyond a reasonable doubt: (1) that the wife intended to put her husband in fear of an imminent battery; (2) that she engaged in some conduct toward her husband which her husband reasonably perceived as imminently threatening a battery; and (3) that the assault was done by means of a dangerous weapon. While the husband’s allegations in and of themselves are enough to satisfy each of these elements, the wife appears to have a few potential defenses. First, there appears to be some question as to the husband’s credibility. He claims that the wife came at him with a kitchen knife and swung it at him repeatedly. He further claims that she then locked herself in a room with their children. The article appears to indicate that when the police arrived, the wife was still in the room with the children, yet when they entered the room, they were unable to locate any weapon. 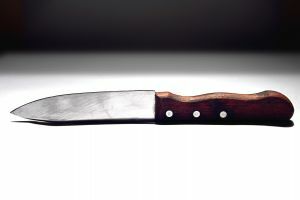 In light of the fact that the police did not locate the knife, and the fact that the husband was unable to provide the police with some alternative explanation as to where the knife might be, the wife could argue that her husband’s version of events was simply not true, and therefore that the Commonwealth has not proven its case beyond a reasonable doubt. In addition to this potential defense, there is also the possibility that the husband will ultimately decide that he does not want to testify against her. Usually, when a person calls the police, reports a crime, and the police have made an arrest, the prosecutor decides how to proceed with the case. This is true even if the person who reported the crime does not want to testify at trial, as the prosecutor can subpoena the witness and force him or her to provide testimony if the prosecutor so chooses. This ability to compel testimony, however, is not unlimited. One exception to the Commonwealth’s ability to compel testimony is called the “spousal privilege.” This privilege, laid out under G. L. c. 233, § 20, states that a person cannot be compelled to testify against his or her spouse. Whether a witness exercises the spousal privilege, however, is up to the witness, not the defendant. Therefore, in this case, the husband would have to choose to exercise his spousal privilege – the wife could not choose to exercise it for him. If the couple has made amends by the time that the case goes to trial, or if the husband decides he does not want to testify against her for some other reason, the Commonwealth would not be able to force him to testify against her. While it is unclear whether the husband will ultimately choose to exercise his spousal privilege, a good defense attorney will certainly send an investigator to go speak with the husband to determine whether he is interested in pursing the case. If it turns out that the husband would prefer to resolve his issues with his wife outside of the courtroom, the wife’s attorney can alert the court to the husband’s decision. Because the husband is the only witness to the alleged assault, the Commonwealth would be unable to proceed with the charges against the wife if her husband elects to exercise his privilege. Whether or not the husband decides to testify, however, the wife will need a defense attorney who understands the complexities that arise when one spouse has made criminal allegations against the other. If you or a loved one is facing a similar situation, you will likewise need an attorney who is sensitive to these issues and who will go the extra mile for you. Attorney Daniel Cappetta is such an attorney. He has successfully represented many clients under these circumstances, and will put his considerable expertise to work for you. Call him today for a free consultation.